← Beard Beer is here! Last year the Priestess and I took it upon ourselves to attend as many beers festivals as possible in an attempt to gain insight into what makes such events either a resounding success or a dismal failure. I originally wrote this immediately following festival season but never got around to publishing it. With another round of festivals gearing up this summer I thought now might be a good time to follow through. The following are subjective opinions based upon hazy observations. We have some opinion about behind the scenes organizational issues, but the focus of this worthless diatribe is on the attendee experience. First, beer festivals seems to come in three general categories – those that cater to the masses with no intention to draw in beer snobs, those that attempt to appeal to both novice craft beer drinkers as well as jaded snobs, and finally those that focus on “special” releases meant to attract even the most hardened snobs. Successful festivals choose what groups they intend to attract and publicize accordingly. If the organizers intend to attract jaded craft beer drinkers then they often publish a list of the “special” releases before the event, if they won’t have anything “special” hopefully the organizers make sure that is clear as well. 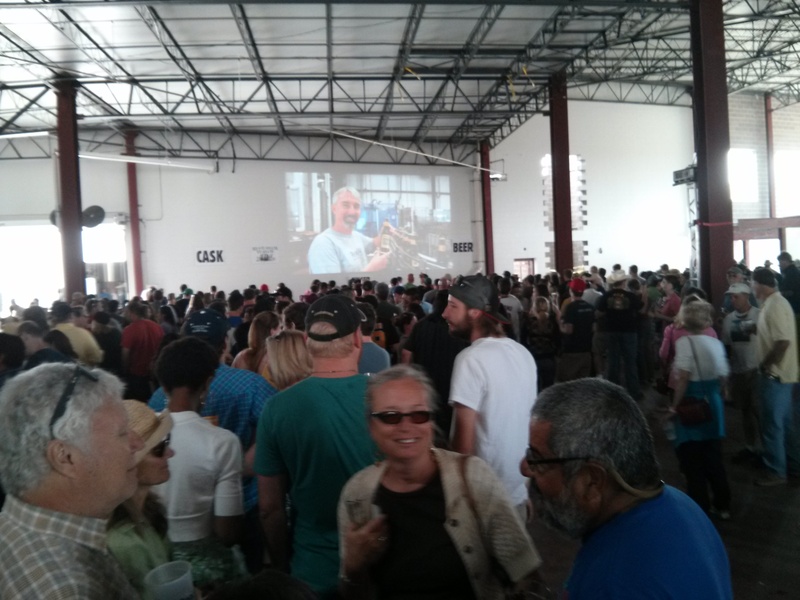 One annual event at Boulder Brewing is an example of why the latter matters. It is a festival promoted as a craft beer event that serves predominantly light styles with no “special” releases to a crowd of 20 somethings that (thankfully) pass on the one or two more interesting offerings. Avery’s IPA Festival is a more successful example of an event at the other end of the spectrum, as promoters promised a huge range of hoppy beers and then deliver with over 90 examples from across the country which seem to satisfy the most hardened of local beer snobs. When it comes to organizing a festival there are many considerations and it continues to baffle as to why some organizers in the Southern states would hold outdoor events in the summer (or conversely those up North would do the same in the winter). Some consideration should also be made to alternate competing events if at all possible. I am also a huge proponent of capping ticket sales and splitting up sessions – if beer lines take 10 minutes or more on average (realizing some booths will get significantly more people than others) then there are too many people at the session and the experience will suffer. Organizers want to make a profit, but does admitting more attendees and creating huge lines or even selling out of beer early and creating lingering discontent worth it? GABF does a good job of this given the apparent demand for tickets these days. Entering a festival can sometimes be problematic. For one thing, if you say a session starts at noon then organizers should begin checking IDs and letting the line move at noon. If a session lasts 5 hours and an entrance delay costs an attendee 30 minutes you have devalued their ticket by 10%. Punctuality is important as is organization and people do notice. Once inside the festival grounds its important people know where to go. There should be signs for volunteers as well as festival goers. The Texas Craft Brewers Festival in Austin last year did a great job of that of utilizing both large font signs as well as arrows after a fair amount of confusion the year prior. Organization can also extend to how booths are laid out. At several events we spent much of our time wandering to find out where individual breweries set up because there was no apparent order to their placement. Once again the Texas Craft Brewers Festival is an example of how simply setting up breweries side by side in alphabetical order can improve flow and attendee enjoyment. If there is one central complaint at a beer festival it normally involves, not surprisingly, attendee access to beer. Long beer lines can be frustrating, and although they are sometimes unavoidable, as when a brewery breaks out their special anniversary barrel aged concoction everyone wants to taste, there are things that can be done to help speed the rate at which attendees are helped. If lines are huge organizers could consider using a bar-back to fill pitchers as they do at GABF. As an aside anything pouring with too much foam should be drawn into a pitcher regardless of line sizes. Another fairly simple way to speed things up involves helping attendees choose before they reach the server. Very few events attended last year successfully accomplished this. In some cases attendance was such that it didn’t matter, but at others long lines culminated with attendees reaching the booth only to spend another 30 seconds to a full minute deciding what to order. Consider that in a 20 person line another 30 seconds each equates to an extra 10 minutes and you start to see why it makes a difference. A simple solution used at GABF and unfortunately a precious few other events involves posting the list of beers above the booth. An improvement would be to also post a style next to obscure beer names (Dropkick anyone?). Even if organizers don’t get lists until the last moment printing on 8.5×11 paper seems easy enough to do onsite. Water is important at beer festivals. Attendees need to remain hydrated and most also appreciate having some to use for rinsing out sample glasses. Again, GABF has water at every booth and its puzzling why more events don’t ensure it’s on hand. Food is another important commodity at most beer festivals. While it’s great to have the latest and greatest food truck onsite, if it takes them 5 minutes to process an order then there should be other sources for food that include a few pre-made options. At one recent festival several food trucks doled out their selections so slowly many people simply left their place in line and went back to drinking, a somewhat disturbing trend given the possible repercussions. Well, there it is our synopsis of some of the things that make festivals successful in no particular order.